I must admit that’s how we felt too after a day and night of the heaviest of rain. This morning seemed a little brighter perhaps? Anyway, no use in staying fed up – first stop our internet hot spot to follow up a text from Sally to say that she and Guy have been at the local hospital all night but were home now. Knowing our accident prone grandson, we guessed correctly that he had a broken leg and was in plaster! A illegal football tackle from an opposing player and poor Guy was stretchered off in pain. Had a long chat with Sally and Sean. After publishing yesterday’s post it was off to the petrol station at Salen to fill Bessie up. £1.41.9 a litre – expensive but at least not too bad. 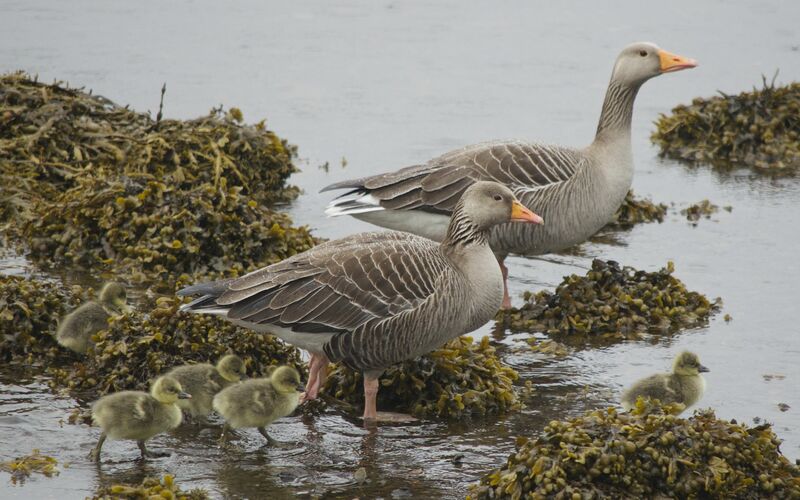 On the way, we spotted this gorgeous family of Greylag Geese – mum, dad and five little goslings. 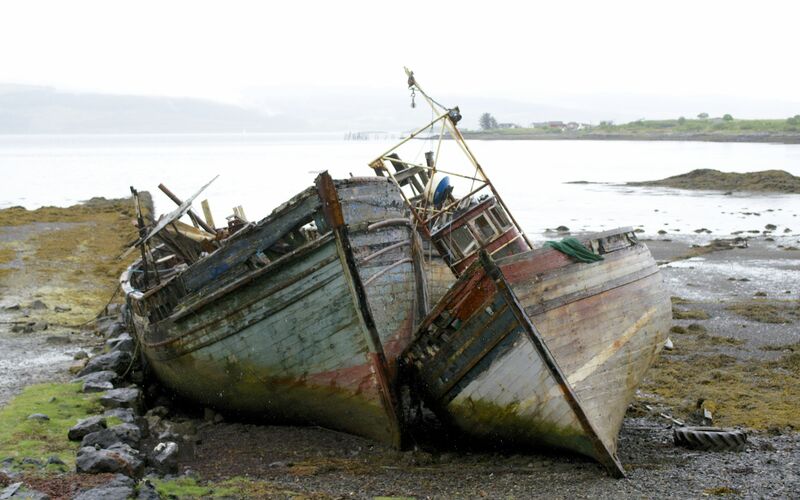 I have a particular fondness for old wrecks and these were particularly picturesque ones. From Salen we decided to follow the B8073, a single track road around the northern coast of Loch na Keal where beside the loch we spied a gaggle of twitchers with long lenses all pointing upwards at the pine forest on the landward side. 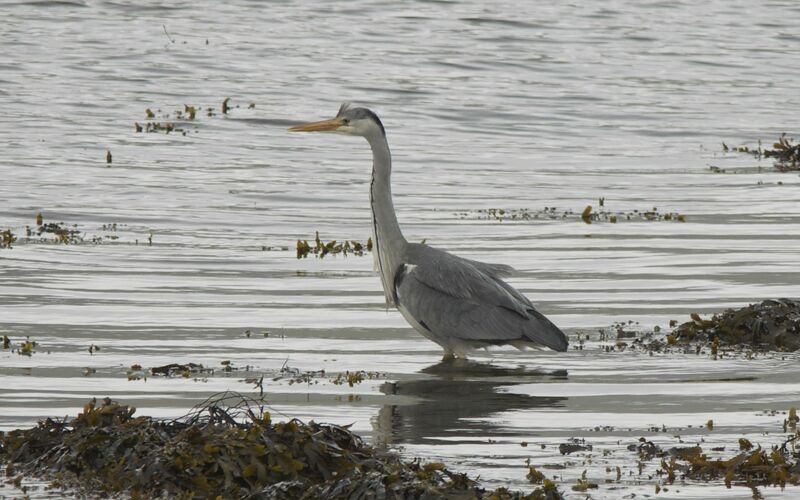 We parked up and I took lots of photos of an elegant Heron by the lochside while Peter scanned the trees to try to see what they were all looking at. Suddenly he asked for the camera and started clicking away. Even without binoculars you could see this bulky form near the top of one of the trees – about a hundred yards away. 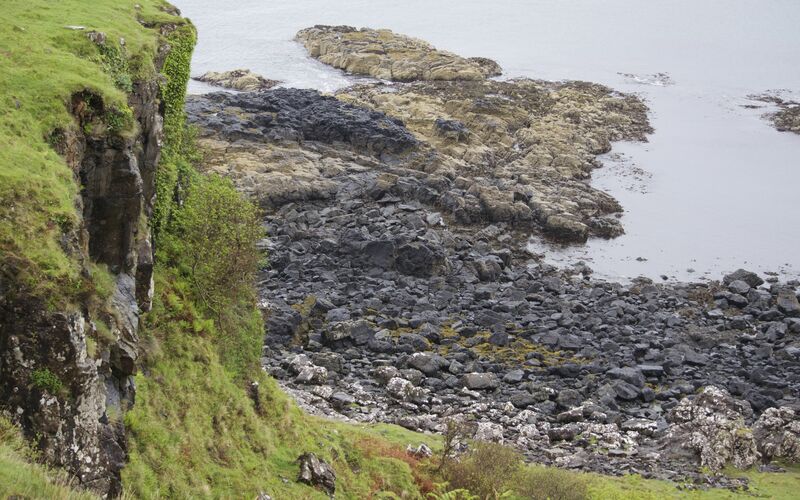 A quick glance at one of the photos revealed… a White Tailed (or Sea) Eagle! This is a rather grainy photo but I think you can make out that massive curved yellow beak? What do you think, Sean? Mull is renowned for its Eagles, both Golden and White Tailed but we were delighted at last to see one while in Scotland. 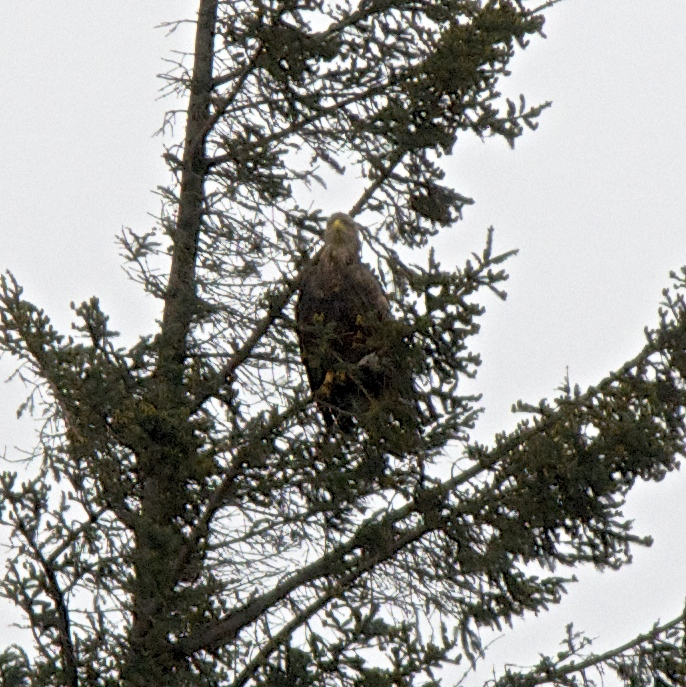 We stayed parked for some time but unfortunately missed the moment, photographically, that the Eagle decided he was bored and flew off behind the trees. Fantastic. We drove on feeling very pleased with ourselves and enjoyed a strange battle between two Pied Wagtails in the middle of the road! 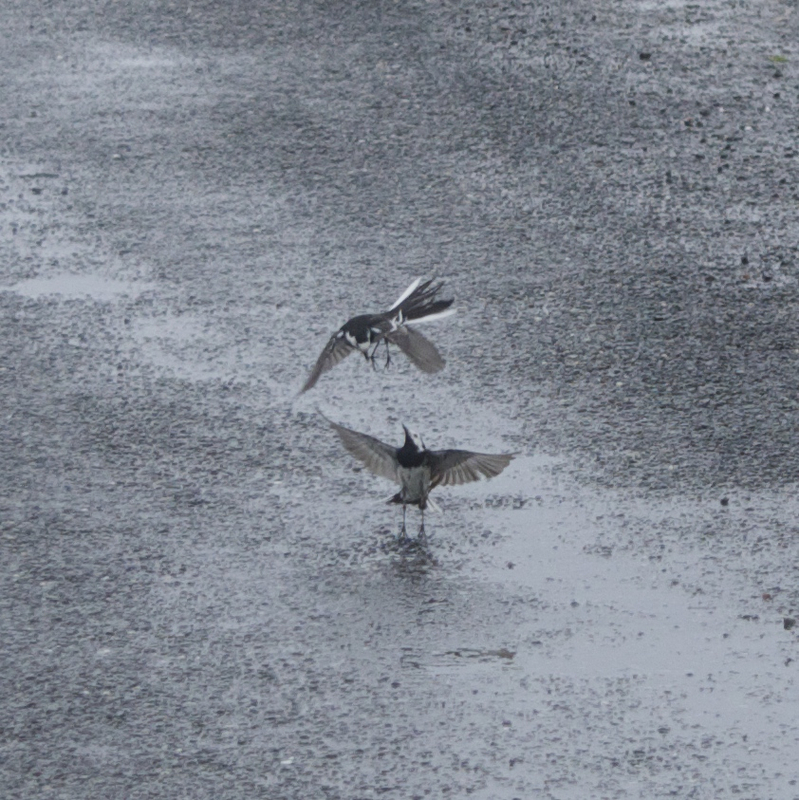 Not sure whether they were fighting but thought that probably it was more of a mating ritual. 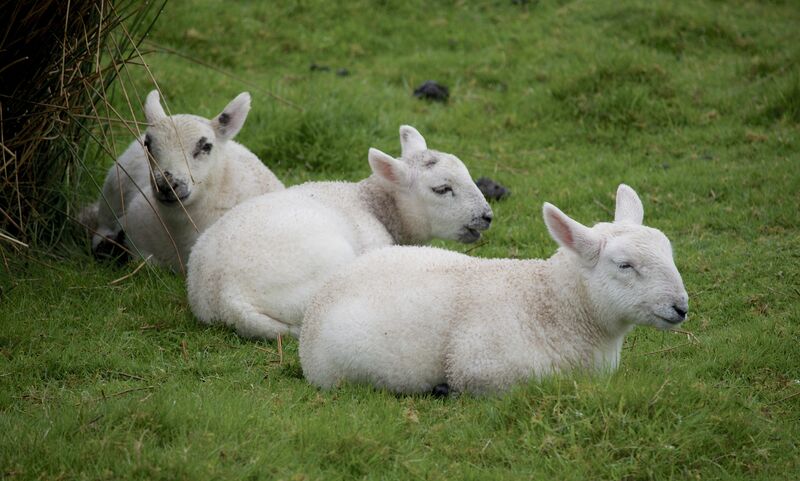 It may have stopped raining but these lambs obviously thought that togetherness was the best option. 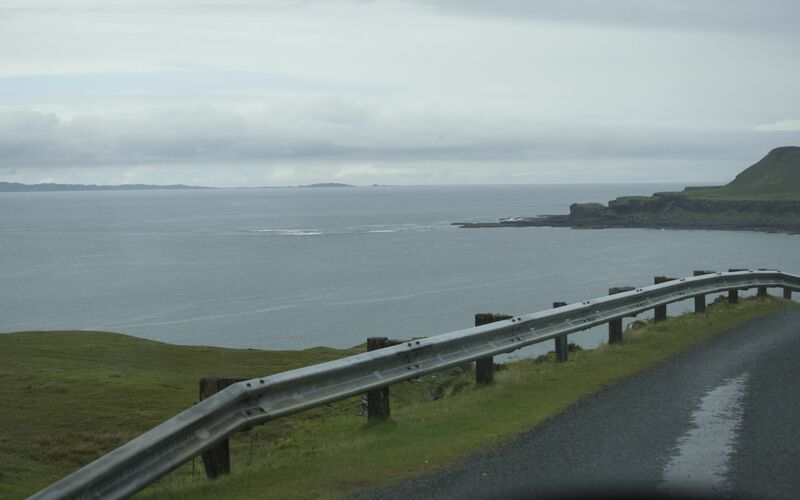 The road got increasingly treacherous, with tight Z bends on steeply rising ground with the most scary drops we had ever seen – and that’s saying something in Scotland! Eventually the road started to come down and ahead was a gorgeous beach at Calgary – white flat sand and a little boat tied at anchor. 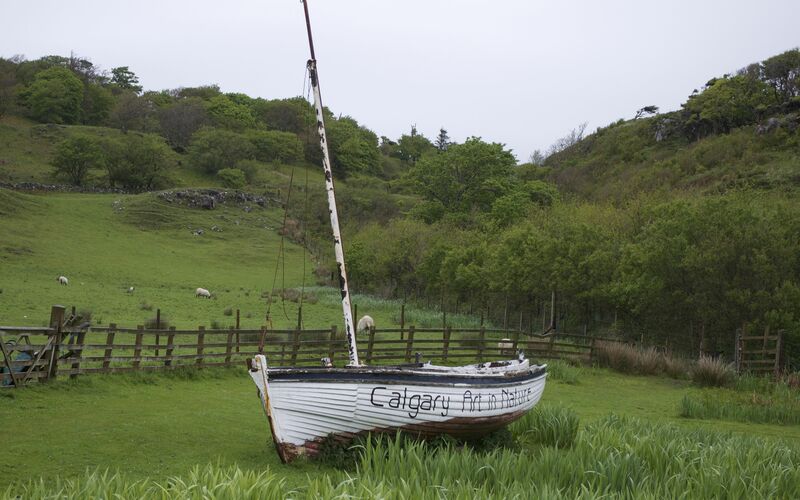 I had read of the Calgary Art in Nature exhibition (and tea room!) and hoped that it would still be open. It was still open – just – so we celebrated with coffee and cake. Very nice. 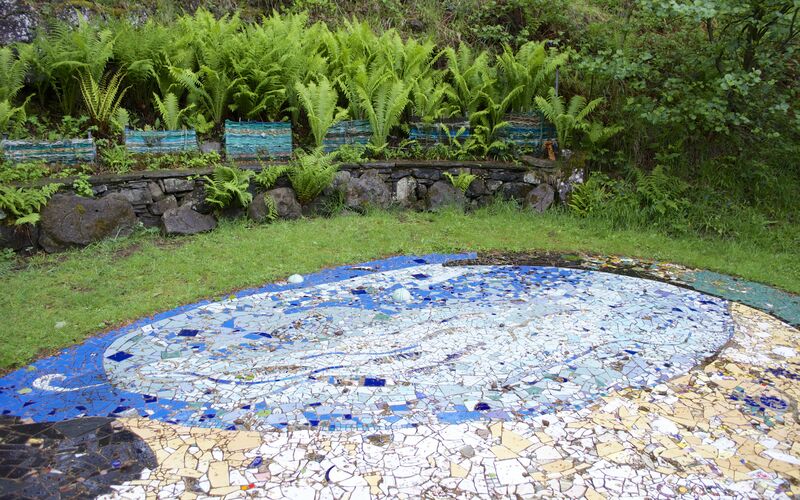 There were some lovely pictures and other craft items for sale and the whole place was very well set out, complete with sculpture trail. 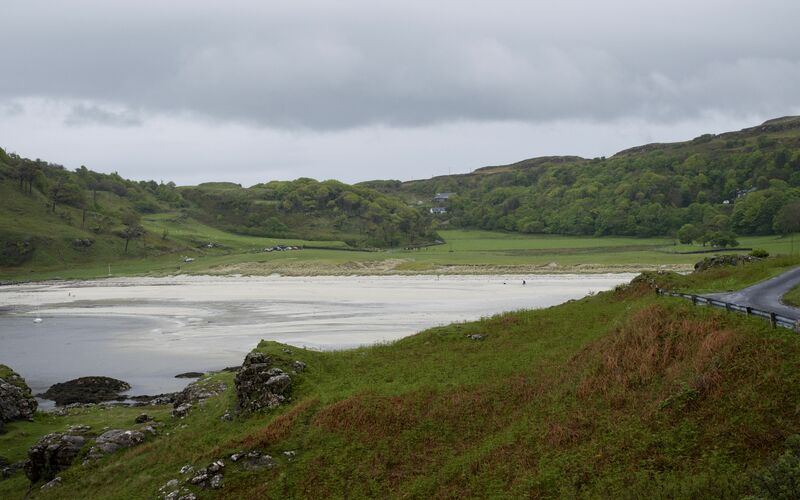 We didn’t have time to look at everything but perhaps we can come back before we leave Mull. Back at the campsite the sun has finally appeared and we’re very hopeful of a rain-free night and, most importantly, a rain-free day tomorrow! Amazing!! An eagle at last. Yes, I think it’s a White Tailed Eagle too. 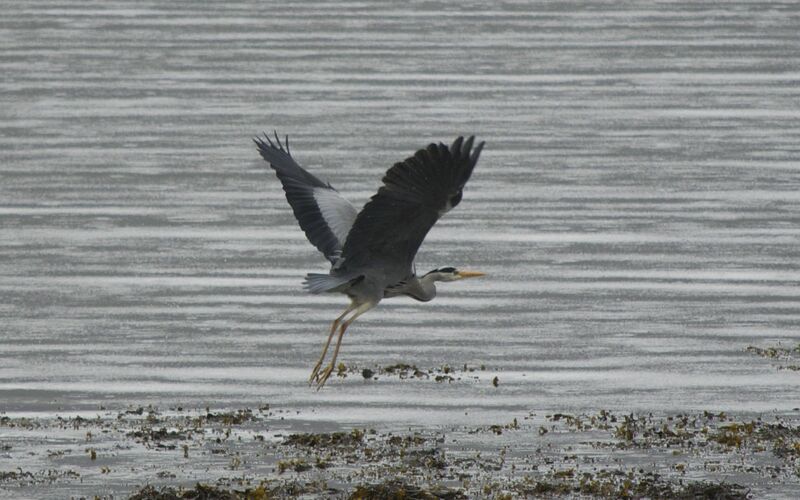 Love the Heron and Pied Wagtails fighting. Looks like you had a much better day. Here’s hoping for more sun. Thought you’d like it Sean! Couldn’t get over how big it was. EAGLE!!!! Lovely sunset as well to end the day. It was HUGE! Now for a Golden one… How’s your leg today? They are bigger, or can be bigger than the golden. Not too bad. But it still hurts quite a bit. I expect that the Canadian one was named after this one though. Not sure if there are any other Calgarys in Scotland. 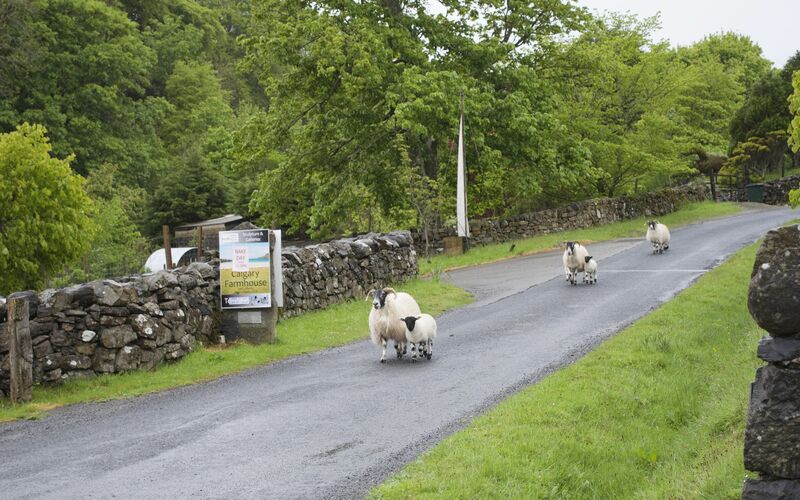 And now there’s sheep doing a four-legged race! Is there anything they can’t do?! Nope – they’re very bright!